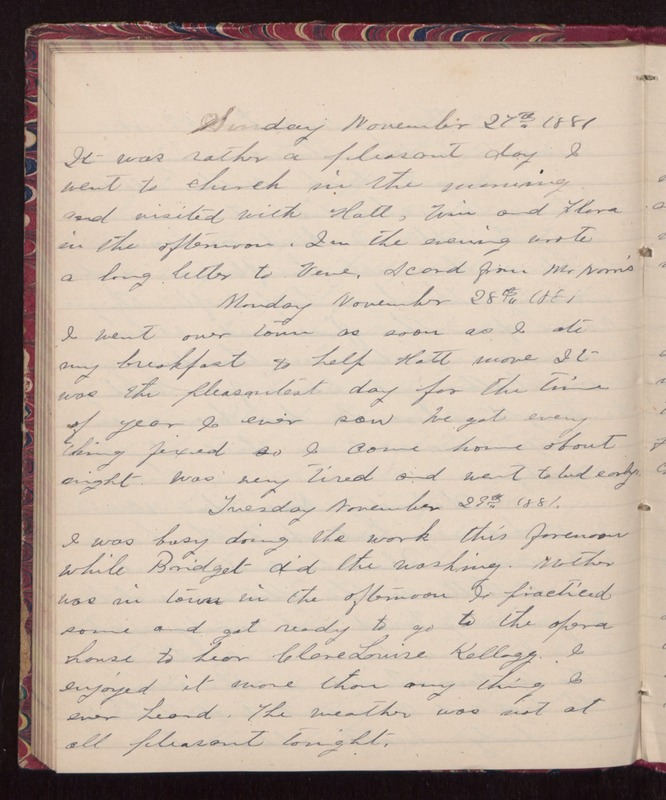 Sunday November 27th 1881 It was rather a pleasant day. I went to church in the morning and visited with Hatt, Win and Flora in the afternoon. In the evening wrote a long letter to Vene. A card from Mr Norris Monday November 28th 1881 I went over town as soon as I ate my breakfast to help Hatt move. It was the pleasantest day for the time of year I ever saw. We got every thing fixed so I come home about night. Was very tired and went to bed early. Tuesday November 29th 1881. I was busy doing the work this forenoon while Bridget did the washing. Mother was in town in the afternoon. I practiced some and got ready to go to the opera house to hear Clare Louise Kellogg. I enjoyed it more than any thing I ever heard. The weather was not at all pleasant tonight.